The Ukraine is a nation with a long and somewhat sad history. Their glory days were in the 11th century, and since then they have been conquered and re-conquered by their larger neighbours. From 1921 to the end of WWII there had been 16 million Ukrainian deaths, some by forced famine and some by war. The devastation these other nations have left in their wake is still evident in 2011. The people of Ukraine are poor; they work hard, are extremely hospitable, and are accustomed to sacrifice. These traits are no less evident in the believers. Brother Igor is the pastor of a church in the large university city of Kharkov. Many believers who have university degrees are acquainted with one another through schools there. 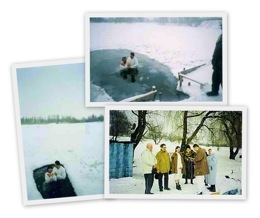 There have been many times that Brother Igor has performed baptism services in the middle of winter, and without the convenience of an indoor tank the believers carve their watery “graves” out of the ice. 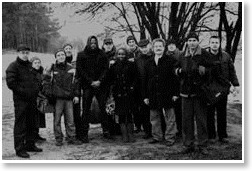 When Brother Guido Vanbrabant visited Brother Igor’s church in 2010 the water wasn’t frozen, but was extremely cold. Brother Guido was holding a series of meetings, and after the Saturday service the pastor announced there would be a baptism service the following morning. 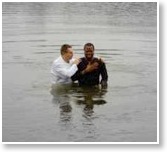 Brother David, from Nigeria, was to be baptized. A lady who had been involved with a charismatic movement for some time had attended the meeting that night, and it was her first time in Brother Igor’s church. Hearing the Message for the first time, the Lord touched her heart and she raised her hand and asked if she too could be baptized. When Brother Guido arrived home he received a message from Brother Igor saying that Sister Natasha, the lady who had been baptized, stood up at a service and said that she had suffered for years from arthritis but shortly after her baptism she was healed. She glorified God for being the same yesterday, today and forever!